Has anyone been to court for grandchild contact and been successful? I've read your posts on here before and I'm honestly starting to feel very sorry for you, and really do hope that you get the help and support that you're in search for. Since everyone stories are different, it would be essential for you to receive some legal advice at this stage, because if you do decide to go to court, then you'll need to persuade the courts that you have a meaningful and on-going relationship with your grandchildren, which significantly benefits their lives - AND one that would have no negative impact on the rest of the child's family relationships. And not to dash any of your hopes but this may be near impossible if you've never even met/seen them, spent any time with the said grandchild or even know their name - for the courts will focus on the relationship between you and your grandchildren, the frequency of contact, and the significance of your involvement in their lives. Truly wishing you all the best and hoping for some healing and reconciliation in the relationships that you have with both your children. Don't forget to take care of yourself. Oh dear, your name alone says how unhappy you are. I am so sorry. My family are going through a terrible time with something similar. As far as I know, in the UK grandparents have no legal rights to contact but I'd like to be wrong. Maybe someone here will know the true facts. With many grandparents actually bringing up children these days, I feel they should be protected by law. One thread here suggested making a Memory Book or box and writing to grandchildren regularly and putting that and birthday/Christmas cards or gifts in there too. When they are old enough, if the estrangement continues, they can have the box and know how much they were loved all along. It is possible to have this written into your will, to have the box or book handed over by a solicitor, to make sure they get it, without parental interference. Whilst I feel for you not having contact with your DGCs I myself would never consider going down that route as it will surely cause more bad feeling from the parents. Go down the memory box route and possibly in time to come things could be resolved between you and the parents concerned. You'll need to speak to a solicitor about the laws in your area. In Alberta (where I live), in order for grandparents to obtain visitation rights, the first question to ask is whether the parents are married. If they're not married (never married, divorced, or one parent is deceased) the grandparent(s) can apply directly. If they're married, the grandparent(s) must ask leave of the court to apply for access. One it's established that the grandparent(s) can request access, the court focuses on three factors. The grandparent(s) must prove that: a relationship between the child and the grandparent(s) existed; the relationship was severed; and it is in the best interest of the child that the relationship be continued. Consequently grandparent rights are very difficult to get. Note that this is specific to Alberta and may not reflect the situation in your area. A solicitor would be able to advise you. One thing you should be aware - if you take the parent(s) to court and fail, it's quite likely that you will never see your grandchild(ren) until they are adults. I second the memory box idea. I just wouldn't suggest that you arrange for a solicitor to hand it over if the parents are against it - this is, effectively, going behind the parents' backs to access the child, even from the grave. On the estrangement support thread (over in Relationships), occasionally Yogagirl posts. She did go to court over this IIRC. She may be willing to discuss her experiences with you. Devastatedgranny As Muffin has said above and as I have said to you on your other 3 threads, I did go to court, 3times; first time they didn't show, second time they had a barrister and the request for a visitation order to see my GC was contested, third time it was thrown out, even though my GD lived with me before her stepdad came on the scene and we had a very close & special bond as her father & the rest of his family had no contact with her through their choice, not my daughters, so I was not 'just' a grandparent but the second parent in her little life. Going to court will be the nail in the coffin. It will always cause not only the parents but your grandchild a lot of stress. The parents will resent you more and the child will eventually learn that they are legally being forced to you which will cause resentment. I have never seen court intervention do anything positive long term for grandparents relationship. If you win, you get what you want for the moment but it has lasting long term affects on that child home life. Grandmom time will be connected to negative feelings. I agree with you Chatty The children have nothing to do with the court hearings though, or anything else. If I could turn the clock back, I wouldn't go there. Normally the courts would be the last place I would go, but when this first happened I was so traumatised and knew time was of the essence. Also it's a fact that a grieving brain doesn't work the same as normal and I was grieving big time, just wanting a fast channel to my beloved GC and thereafter [ I thought] to my AD. Yogagirl do you see your gc now? If I remember your other posts well you haven’t seen the infant in 11months. This will go against you as you have no meanginful pre existing relationship with the child. You must seek advice now to help you understand what will happen. Yoga had the children Living with her. And she still lost. You should really listen to the people who’ve been there. Devastatedgranny into the 7th year of not seeing my once DD and beloved GC. The first few years I was really suicidal, I missed them sooo much. I'm in a better place now, after all these years, but still think of them every day, a lot. I try to push the thoughts out of my head, as they depress me so much, but they insist on popping right back in. The special bond I had with my GD is all gone now, still there in my heart, but my GD wouldn't even know me now So tragic! It's a catch 22 Devastatedgranny If you don't act quickly the courts will say the GC don't know you anymore, it can take a year from start to first court hearing. But then acting that quickly, as I did, then squashes any chance of reconciling in a more natural way. Steer clear of court at all costs - and it will cost you a fortune, trust me. Please listen to those who know, especially yogagirl who has told of her experience. I am very sorry that you are feeling so sad and I do understand, as do many of us GP on here who have no contact with our GC, but I can assure you that you will feel better with time. I am another advocate of the memory box. I have put presents and cards and little notes in the one I keep. If the GC ever get to see it they'll wonder what they're supposed to do with first size clothes, hand knitted shawls and toys, but they will know we have always loved them and think of them, and it makes me feel better. In fact my DH and I will be shopping for another Birthday card this weekend to put in there as one is coming up. I confess to buying my 'lost' GC Xmas gifts this year. 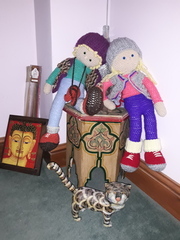 A local lady made this knitted dolls, about 2ft high, they were so lovely, all the clothes, booties & socks, bags & hats. I actually asked for them to be made in my GC image [as much as a knitted doll can] They were so lovely, when she finished making them, she sent me a pic and I said I liked them so much I may purchase a duplicate set. She went ahead and made the duplicate set, so I've ended up with two sets One set I will wrap and put in their gift sacks, the other I have put in the nursery, which was my GD bedroom when she lived with me. Sad or what! It gives support to grandparents in difficult situations. My daughter went through a nasty divorce. For all sorts of reasons her ex-husband and his wife ended up with care of our two grandchildren. As part of the child access agreement, we managed to get an agreement that we would get the girls for a week every summer. Give the father his due , he has complied with this each year. We will have the girls for two weeks this summer. Yes it is expensive as I need to fly into UK to pick them up and then fly them back but so worthwhile. Going to court can work but, as in our case, it very much depends on the parent who has custody of the children to be willing to make it work. Also cost us over £15k in legal costs so very expensive. devastatedgranny Some wise and thoughtful advice for you here with a consistent theme about getting legal advice but also about the chances of the success and the reasons for not doing it. I believe you ae going round in circles in your mind with this problem and worry (understandably) ...so some legal advice would at least give you something on which to base writing down the pros and cons of going down this route. Yoga is clear about why she made a mistake by going to court so it is worth considering her viewpoint very carefully within the context of your own situation. The memory box might also help you to feel you are doing something; it won't take away the pain but it might give a little comfort. Here are the dolls. I had just took them upstairs Wednesday, ready to put in the spare room to wrap up, just plonked them down on a little table in the corner of the landing & they just landed like this, with their heads together, so cute, I've just left them there.